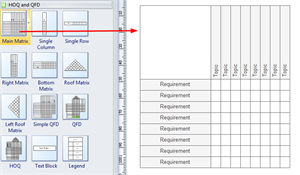 This tutorial explains how to create a house of quality matrix with Edraw Project Management software, with which you can have a better understanding of the building process and work more effectively. 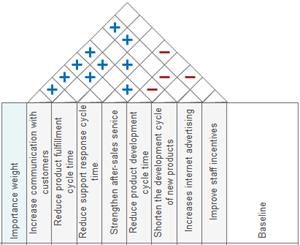 A HOQ diagram is used for defining the relationship between customer desires and the firm capabilities. Although it looks intricate, it is capable of presenting much information and comparing large amounts of data. 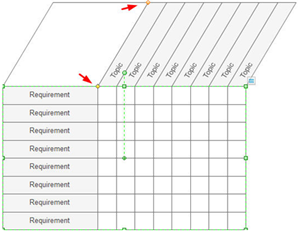 Edraw makes it fast and easy to create a house of quality matrix with its pre-defined template. Below are the instructions. 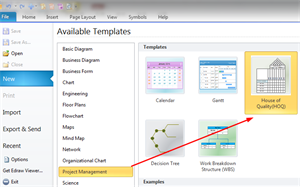 Open Edraw, on the start page find Project Management category and double click House of Quality template to get into the drawing page. On the left of the drawing page, you can find all the shapes and symbols for House of Quality Diagram in the library. Simply drag a matrix shape from the library, and drop on the drawing page. You can also drag a complete HOQ template. 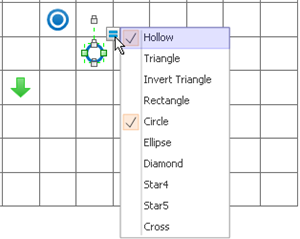 Click the shape and you will see a floating button, through which you can add or remove rows and columns. 1. Click the shape, and the green and yellow handles will show up. 2. Drag green handles you can change the size of the shape. 3. There are two yellow control handles, through the one on the top you can change the height and tilt angle of the upper part, while through the one in the middle you can change the size of the columns. 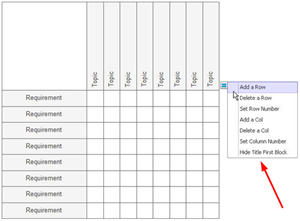 Add text to the rows and columns labels by double clicking the boxes and typing. The symbols are dynamic, which can be snapped and glued with the matrix together. 1. 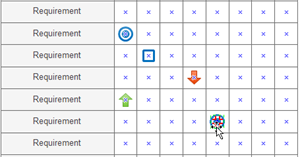 Drag a required symbol from the library and approach to the matrix shape, and each box will appear a blue X. 2. When the symbol gets to the right position, the blue X will turn red. Release your mouse, and the symbol will be glued with the box. 3. Each symbol has more than one styles inside, you can click the symbol and choose more options through the floating button. 4. The color of the symbol is changeable. Select a symbol and go to Home menu, Fill button to change the color. Read Fills, Shadows and Patterns to learn more about the fill function. The Correlation shape, which is usually used as the "roof" , is added and modified the same way. Here are some complete examples of House of Quality created by Edraw.